Growing a small or medium-scale business to a global brand has not always been easy but has never been impossible too. Today, in techpally interview series, we meet with the CEO of BeepTool CIS limited, Mr. John Enoh talking business and his coverage in Africa and other parts of the world. Good day Mr John, Can you introduce your company? Our company is BEEPTOOL CIS LIMITED, “BeepTool” is a privately held VoIP, Instant Messaging and Financial services venture registered in Nigeria. A fast growing proprietary cross-platform communication VoIP and Instant Messaging presence platform developer and operator that brings networking and communications possibilities together. Our BeepTool web and app were developed and launched in the third quarter of the year 2014, fully integrated with calls, instant messaging and financial services functionality. Our registered users are over 1 million with more than 30% of users who are active on a month by month basis. What’s the state of VOIP technology and E-commerce in Nigeria? VoIP technology came into Nigeria as soon as internet berthed and its usage has been growing ever since with the figure below showing the most recent share of 0.03%. E-commerce on the other hand has been gaining popularity with internet access, convenience and speed of service delivery. It is estimated to be growing at 25% percent annually. 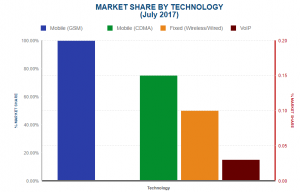 Percentage market share by technology in Nigeria (Source: Nigerian Communication Commission, 2017). We know you have much products in your portfolio, How do you describe the classes of your services? Yeah, you’re right; Our BeepTool has four integral product offerings listed below. Mr. John, Can you describe each product/service and your standouts in the market? Free BeepTool to BeepTool (on-net) calls including group calls of up to 100 users. BeepTool to other networks (off-net) calls (prepaid or subscription). BeepTool Ping: This is a micro payment system integrated with the BeepTool platform. It allows users to transfer small amount of money, 20USD or less, to another BeepTool User’s account. BeepTool Money : a very laudable service that enables users of BeepTool to send and receive money to bank accounts or mobile money wallets from anywhere in the world. Money request can be raised from a user to friends and family. Students, parents and business individuals can receive money while in Nigeria and also transfer funds. For those who have problem receiving small amount via wire transfer, Moneygram or WesternUnion, BeepTool Money is a good alternative. Bill Payment Services (NIGERIA ONLY) : Our bill payment services offer people outside their home or home countries to settle utility bills and other related bills to avoid disconnection. Bills of family and friends could also be settled. Available only in Nigeria at the moment. Account to Airtime Purchase – This is an offer for users to easily recharge their BeepTool account directly from their bank account, directly in addition to debit/credit card and Vouchers. This is similar to mobile top up and USSD recharge. With our BeepTool, there’s no barrier in communication. BeepTool is taking leap over competitors everyday and we’ve been outstanding in what we do and the BeepTool platform is giving value to our clients. DID’s virtual number – We’re able to offer virtual local phone numbers to registered users at lowest possible cost. Virtual local numbers offering is available for more than 70 countries, across Europe, Asia and Africa. international mobile top-up – This is a cross border mobile top-up. Our mobile top-up services is connected to more than 400 carriers globally and services are rendered real-time. This is a world class service quality and we’ve been able to beat the expectations of our new users. Voicemail, Call Waiting & Call Transfer – Voicemail boxes can be set-up for individual or group. Voicemail can be sent to e-mail (MP3 file) and notification of voicemail arrival through IM or Message Waiting Indicator is available. Users can also setup personalized greetings, forward, transfer or activate call waiting. BeepTool enterprise solution is a customizable plugin that is equipped with multitenant architecture, mobile client, WebRTC client, auto-attendant and essential PBX services among others. This is an invaluable tool for customer services and support. Let’s talk Money now, Remittance Facilities are expensive but the market is booming in Nigeria, How do you intend to control reasonable market share, manage security and trust? We’re on track, getting BeepTool better everyday in order to control a reasonable share of the estimated $20billion remittance market to Nigeria by offering attractive incentives to our users, including rates, access, issues resolution response time, etc. To maintain security, we collect Know-your-customer ( KYC ) data of remittance services of users, user/transaction verification and periodically improve BeepTool site and app security with modern technology. We know people can send money across different countries to Nigeria with BeepTool Remittance Service but can Nigerians send money abroad on your platform? Thank you for this question, At the moment, we can say No because our payout agreement and technical integration with payout partners are not finalized yet. As soon as the agreement and integration are completed, it will be announced on our website and this will definitely become a great achievement and also improve productivity. It’s nice having you on board, can you tell us about the Talk & Text App, its features, your rate and the drive behind VOIP? BeepTool app is an Android and iOS based mobile app designed to provide affordable communication, remittance and money transfer services to registered users on a single platform. The app has a cross-platform group chat or group call which can put dozens of persons with different mobile operating systems into one call and chat thread. Our rates are designed to provide affordable communication to Sub-Saharan Africa and emerging economies worldwide. VoIP is, at the moment, one of the cheapest ways to provide communication and related services to users and for us to provide the possible best service for users at low cost. VoIP is the answer to the call and Nigerians are really embracing it. Even countries like US, India, China etc are not left behind in Voice over internet protocol technology. With internet users increasing in nigeria and other African countries, Where do you see broadband penetration in Africa in the next ten years? 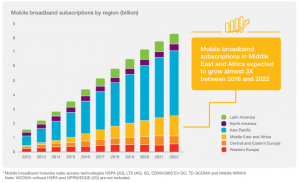 In the next ten years, broadband penetration and subscription is expected to rise three times the current subscription according to Ericsson Worldwide Report in June 2017 as shown in the figure below. BeepTool will no longer depend on broadband in the near future but on a more effective satellite narrowband communication technology. Could you tell us what BeepTool UAO Club & Investors all about? BeepTool Use-and-Own Club (UaO) is an investment plan designed for BeepTool services’ users to own a part of the company and be able to contribute to discussion on how the company is run, stay ahead of others about current and future developments. It means you can be part of the company as well as other investors by bringing funds and benefit from the growth yield. Ohhh, that’s interesting. Now, unemployment is still a serious challenge in Nigeria and Africa, How can people benefit from BeepTool Retail initiative and how can it help youths to earn income? BeepTool Retail Stores are designed to be mobile payout point and retail store for BeepTool services. Operators of such store receive commission or discount on each item sold or service rendered on behalf of BeepTool. We would like you to mention some of your busines partnerships? We have partnership agreement with Interswitch Nigeria Limited, JNFX International and TransferTo for mobile money and financial services. We are also in partnership with Sky and Space Global and to debut satellite narrowband communication smart app and devices in Africa. This is commendable and we hope awards would be knocking your door soon.When can you say you start making big wave in the ICT industry? Hmmm, that’s 2014, when the Beta version of BeepTool app was released. It was a notable step in the business. What is the latest development of the company and the latest achievement in terms of productivity? Re-design and migration of all interoperable links of user web interface, this would go live soon. Native design of fintech services to BeepTool app rather than existing web connect. Multicurrency configuration of our services instead of a single dollar denomination. Unify BeepTool ping transfer amount on Android and IOS version of BeepTool app. What’s still your biggest challenge and what are your plans to overcome it? Our biggest challenge at the moment is funding, we are talking to investors to raise fund for our next round of integration and developments. What’s the next big thing to expect from the company to achieve and where do you see the company in the next decade? We will change the landscape of communication in Sub-Saharan Africa when we complete our integrations to provide a narrowband enabled “border-less” communication app which eliminates the use of internet Service Provider (ISP) internet and all its attendant encumbrances. We hope to be one of the biggest providers of communication and fintech services in Africa in the next decade. It has been wonderful speaking with you, What role do you expect the Nigerian government to play in the Communication industry and E-commerce to help driving forward the market and economy at a better pace? The Nigerian government through designated agencies has been coordinating and regulating communication and e-commerce. We hope the government will develop a legal framework to compel agencies and financial institutions to support startup growth and reduce market entry licensing cost for Nigerian startups. How would your potential clients get to you? People can visit us at our physical office in Nigeria or in US. People can also send us Email at info@beeptool.com , visit our website at www.beeptool.com and have live chat with us. It’s a wonderful moment having you, Mr. John Enoh, the CEO and President of BeepTool CIS limited, a company with integrated communications, secure payment, and money transfer in one unique solution. It’s my pleasure to be on this platform, thanks. Do you find the interview interesting, kindly pitch your friends and share it with them . Thanks for the update, is there any way I can get an alert email whenever you write a fresh article?